Armie-Angélique Weinberger works for Sacher since more than ten years and is a close friend to the family. 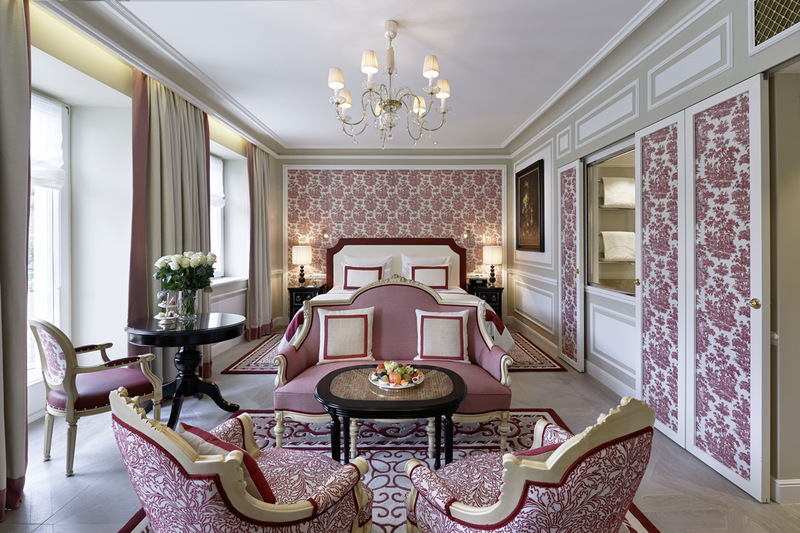 She puts all her heart and soul into the Hotel Sacher Salzburg. 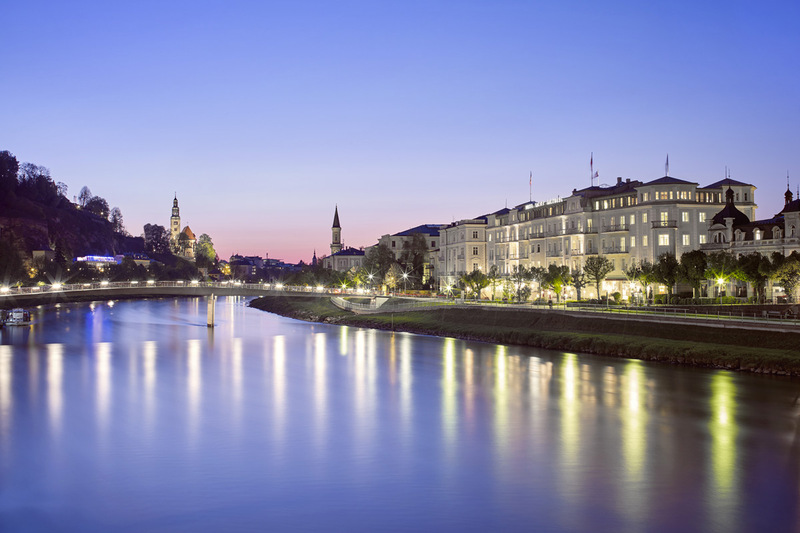 Located in the heart of Salzburg directly on the river Salzach, the Hotel Sacher Salzburg is just around the corner of Mirabell palace, Mozart’s residence, the Salzburg State Theater and only minutes away from all other culturally important attractions. Founded in 1866, Salzburg’s only grand hotel awaits its guests with living traditions and charming local flavors, providing a unique balance of history and innovation. 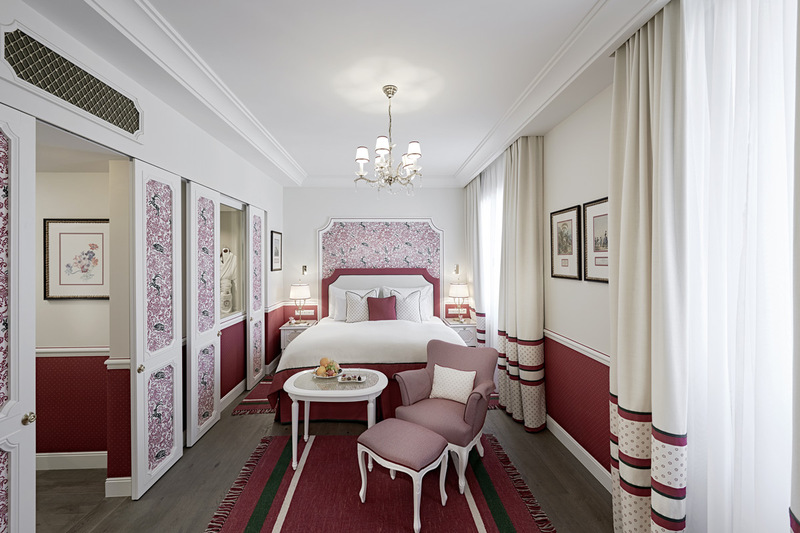 All 110 rooms and suites are individually designed and offer luxury 19th century feel combined with contemporary state-of-the-art comfort. Many rooms and suites offer balconies with stunning views over the river, the Fortress Hohensalzburg and the old town. 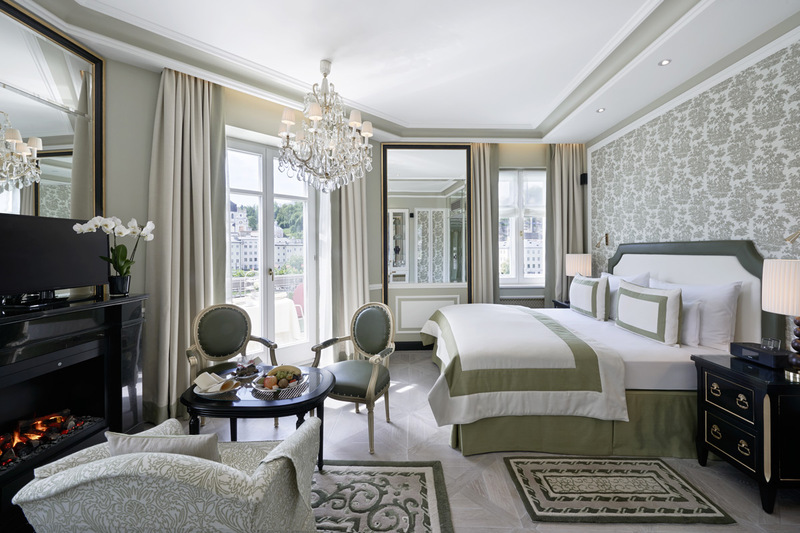 Following the refurbishment of all the rooms facing the Salzach river, additional 30 rooms have just been completely remodeled. 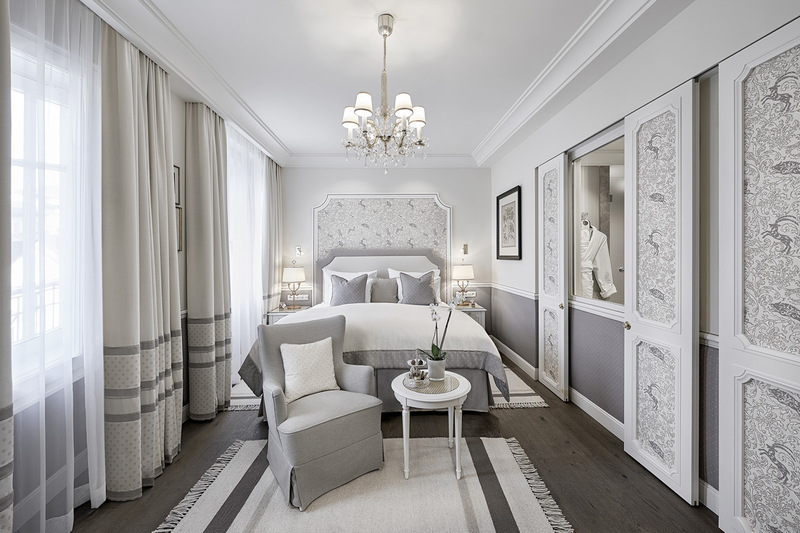 Inspired by noble Salzburg residences, these new rooms overlook the city and provide a sensible combination of local interior designs and innovative trends. To indulge your love to chocolate without piling on any pounds, the hotel’s very own „Time-to-Chocolate“ bathroom amenities provide unique experiences. The exclusive Spa features sauna, steam room, vital sensory showers and cozy a relaxation area. Treatments can be arranged in a private spa suite. Hotels guests can also enjoy complimentary access to the fitness room. Unusual for a city hotel are the many different restaurant and bar outlets which give a true resort feel within an urban space. 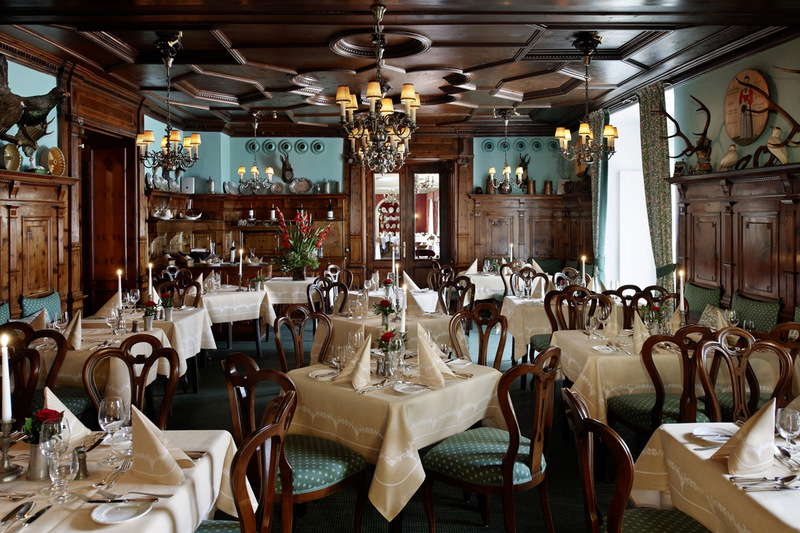 The most typical Salzburg feel can be found at the historic fine-dining hotel restaurant „Zirbelzimmer“. Local and international specialities are served at the traditional restaurant „Roter Salon“, whilst for lovers of grilled dishes, the „Salzachgrill“ is the perfect choice. 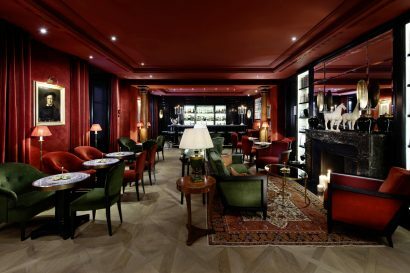 The Sacher Bar is well known as a sophisticated pre- or post theatre drink hot-spot. 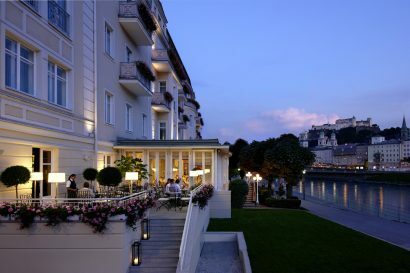 All restaurants and the hotel bar offer spacious outside terraces with magnificent river and old town views. 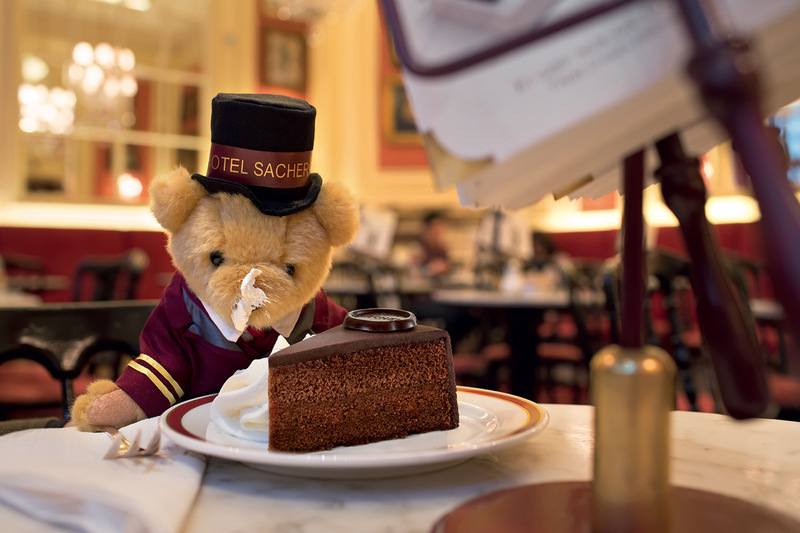 Certainly hotel guests can also enjoy a piece of the Original Sacher-Torte at the „Café Sacher”, which still serves this culinary experience according to the closely guarded hotel recipe of 1832. At the Sacher Hotels time never stands still for our guests and we would like to provide the highest possible comfort and conveniences of current times. Latest renovation was two weeks ago and we will open a new bar in two weeks. 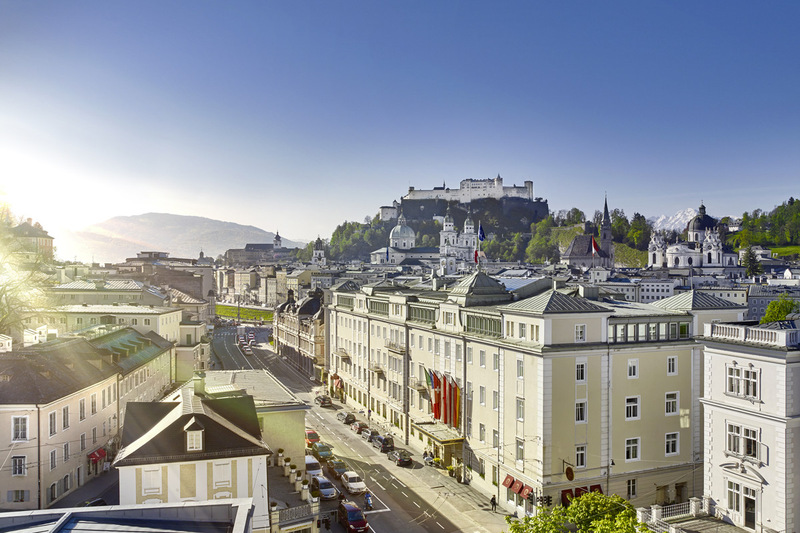 The only family-owned and privately run luxury hotel in Salzburg provides the most authentic sense of place with the most stunning views over the city. The world famous band “Beatles” landed on March 13th in 1965 in Salzburg in order to continue their shootings for the movie “Help!”. 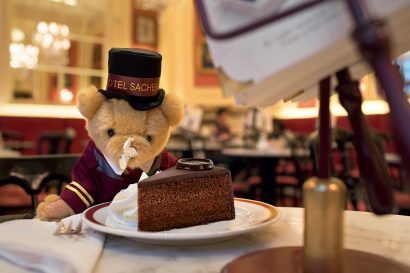 First stopover was at the Hotel Sacher Salzburg, where they held a press conference and enjoyed a cup of tea, coffee and a piece of Original Sacher-Torte. 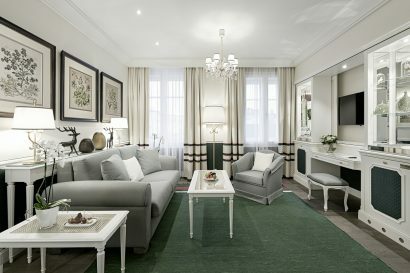 Since then we named one of our Suites after them, where the guests can feel like travelling back in time and immerse themselves into the “Beatles spirit”. Introducing “Petit Sacher”, an all-round feel-good service with the following great extras for you: A welcome gift – Psst! A little surprise for you to take with you! 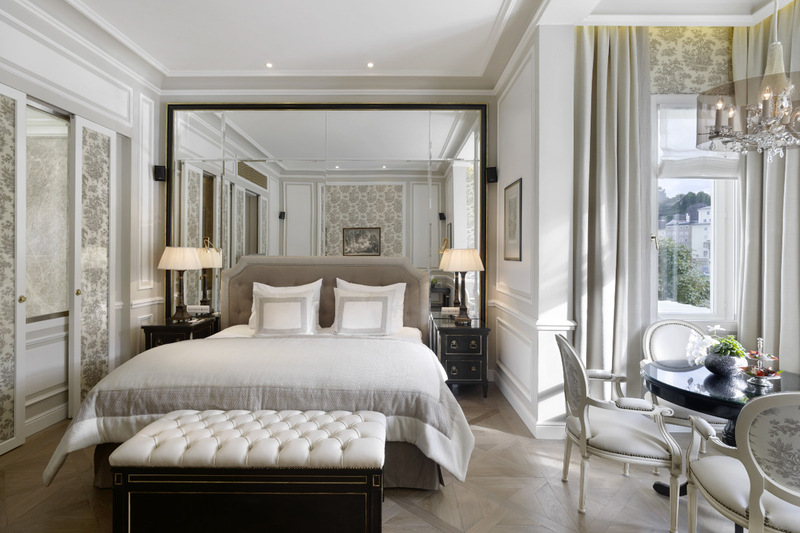 On arrival, you will be given the “My Hotel Sacher” booklet, which will guide you round my hotel! “Petit Sacher” menu in our restaurants – yummy food especially for you! You will find the following goodies waiting for you in your room: – A children’s bathrobe – wonderfully soft and cuddly!- Children’s slippers – so you’ll always have nice warm feet!- A children’s bathroom set – for bathing fun without tears!- A turndown service for children – with a little bedtime treat!- A DVD collection with exciting movies especially for you!- Board games – fun for all ages! Our Sacher kitchen team warmly welcomes you to the Zirbelzimmer and its beautiful ambiance that has been preserved since the opening of the hotel in 1866. Overlooking the “Salzach” river we invite you to enjoy Austrian classics as well as seasonal and refined creations by Executive Chef Michael Gahleitner which already have been awarded a Gault Millau toque. • Sacher Grill – We spoil our guests with the finest grilled specialties. In a most charming atmosphere with a view to the “Salzach” river, you can savour a delicious steak from the Salzburg Organic-Beef, tender trout fillet or our famous Salzburger. During summertime, the spacious terrace invites to informal lunches and dinners surrounded by Salzburg’s beautiful scenery. The café terrace on the banks of the river “Salzach” is a perfect spot for coffee in spring and summer whilst the sumptuous interior ineffably blends the old world Sacher charm with modern comfort. As well as our much-loved desserts, there’s also a variety of delicious savory dishes to enjoy. Coffee house culture is an essential part of Austrian culture and there is no better place to sample it than the Café Sacher Salzburg, where you can also indulge yourself with some Original Sacher-Torte. The exclusive Spa features sauna, steam room, vital sensory showers and cosy a relaxation area. Treatments can be arranged in a private spa suite. Hotels guests can also enjoy complimentary access to the fitness room. The hotel’s conservatory on the river banks offers great views of the spires of the Old Town and makes a superb venue for a variety of events. The conservatory can be arranged according to your wishes and divided into different rooms if that is what you need. We offer a number of packages for meetings, conferences and other functions with 15 participants and more. Hotel Sacher Salzburg provides an ineffable blend of style and elegance that makes is the ideal place for wedding receptions and banquets. Europe´s most beautiful registrar’s office – in the Mirabell Castle – is only 200 meters from the hotel and is reached by a five-minute walk through the enchanting baroque Mirabell Garden. The many churches of Salzburg are also within walking distance or can be reached with a romantic horse-drawn carriage or a more modern wedding limousine. Your fairy-tale wedding – Our banqueting rooms with views over the church spires of Salzburg’s old town provide the perfect setting for a fairy-tale reception. We can help pull together every part of your perfect day to make sure you have a wedding that combines historical romance with modern luxury.